You'll be £9.99 closer to your next £10.00 credit when you purchase Recollections of the Great War in the Air. What's this? American volunteers which were formed into the famous American 'Lafayette' Escadrille. 'Flying for France' was his personal account of the war in the air as seen through the eyes a front-line pilot of the American Escadrille, which was then based at Verdun. His memoirs produce an amazing insight into the early aerial battles and trace the evolution of aerial warfare as the rickety aircraft of 1915 rapidly evolved into the purpose built fighters of 1917. Casualties among the American Escadrille were very high and McConnell's own luck finally ran out when he was ambushed by two German fighters and was killed in action in March 1917. His gripping and detailed memoir of the war is his lasting memorial; his honest account of the everyday life of a pilot in the Great War is matched only by 'Sagittarius Rising'. However his dramatic description of the battlefield of Verdun viewed from above is one of the classic descriptions of any wartime memoir and is unmatched by any other Great War writer. McConnell's memoir is made all the more moving by the fact that the reader is aware that the writer's life will soon be cut tragically short. Essential reading for anyone interested in military history or aviation. Resurrects an important part of the first-person literature of the Lafayette Escadrille. A long-lost gem. Illustrated through the body of the book, this is the memoir of James Roger McConnell, an American pilot flying with the famous French Flying Corps’ American ‘Layfayette’ Escadrille and provides a unique personal insight into the air war in Europe. 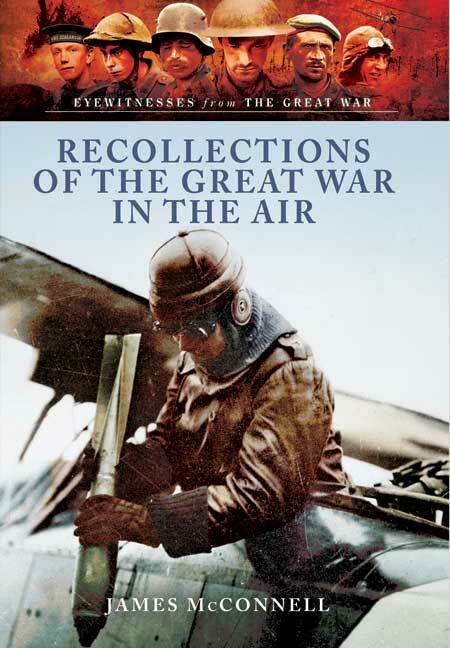 This volume in Pen & Sword’s ‘Eyewitnesses from the Great War’ series is the repackaged memoir ‘Flying for France’, by James McConnell, an American who initially enlisted in the American Ambulance Corps. His experiences in France resolved him to take a more active role in the fighting, and he applied to join the French air force. McConnell writes vividly about the war in the sky; flying at 13,000ft over Verdun he offers a detached view of the carnage below and describes how pilots had certain disconnection with the war going on below them. He describes the tactics of air warfare, and how a rota system was operated so that there were always planes in the air. Two hour sorties were standard, mainly patrols, although on one occasion The memoir and letters give a surprising amount of detail about the pilot’s life and tactics employed. McConnell’s story is certainly an interesting one and this is a short and easily digestible introduction to the life of a First World War pilot. This book tells the story of a young American who served the Lafayette Escadrille, part of the French Air forces. Young American pilots volunteered the French Air Force to fight against Germans. The book shows great detail about gear and aviation technics of both sides which, up to now, I have not read in any book before. For example, the Jerries used ammunition mounted with explosive heads. According to the allied forces this was an act of war crime. Once hit on a plane, there was no way to escape death. This is why, if they could get hand of a German pilot, extra-judicial executions was often his fate. One tale of the Lafayette Escadrille tells the story of a captured German ‘Flieger’ who could only save his life when revealing German army positions. He opted to die stating that he would rather give his life instead, to save the lives of so many of his comrades. The unexpected outcome is that the French took him for a drink out of respect. What possibly saved the guy also is that he spoke the French language fluently. This and other strange stories make the book readable. In 1915 James Roger McConnell enlisted as a US volunteer in the French Flying Corps. He was part of a remarkable band of American volunteers which were formed into the famous American Lafayette Escadrille.